At Baccalaureate level, students can choose to do the Baccalaureate in Spanish in various forms, or the IB® Diploma Programme. Aimed at students of between 16 and 19 years of age. Has its own evaluation system. The curriculum is comprised of 6 subject and core component groups. Theory of Knowledge (TdC), Creativity, Action and Service (CAS) and Dissertation. Students choose subjects from the different groups and levels. Prepares students for entry into the best universities in the world and constitutes an excellent preparation for adult life. Characterised by its international point of view. Develops a lifelong active attitude to learning. The SEK-Ciudalcampo IB® Diploma Programme (in English, or bilingual). SEK-Ciudalcampo has been teaching the DP since 1992. Since 2012, we have been offering the Diploma Programme as a standalone programme independent of the Spanish Baccalaureate, with a truly international stamp. 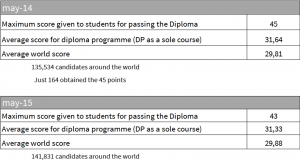 Option to pick subjects in Spanish or English, according to the candidate’s interests and abilities. Using this system, our students can follow their entire course in Spanish (except for the second or third language), entirely in English (except for the second or third language) or bilingually (subject from group 3 or group 4 in a different language from Language A or two A Languages). Commitment to the professional development of our teachers both in official IB workshops and in other aspects of educational innovation. The Guidance Department looks after students personally, advising them about their choice of studies and universities both in Spain and internationally. Use of cutting-edge teaching technologies and resources. The programme makes an excellent training for university and for adult life. It develops an active attitude towards lifelong learning and is characterised by its international emphasis. United States: American University, Brandeis University, Bryant University, Drew University, Duke University, Embry Riddle University, Florida Institute of Technology, Fordham University, George Washington University, Georgetown University, Gettysburg College, Haverford Colleage, Marymount Manhatan College, Northeastern University, Quinnipiac University, Rochester Institute of Technology, Saint Louis University, Suffolk University, Syracuse University, U. of California- Berkeley, U. of California-Davis, U. of California-Irvine, U. of California-L.A., U. of California-San Diego, U. of California-Santa Barbara, U. of California-Santa Cruz, U. of Colorado, Villanova University, Wesleyan University, Williams College. Europe: University of East London, Univ. of Hull, Univ. of Kent, Univ. of Lancaster, Univ. of Leeds, Univ. of Liverpool, Univ. of Manchester, Univ. of Nottingham, Univ. of South Wales, Univ. of Sussex, Univ. of the Arts London, Univ. of Warwick, Univ. of West England-Bristol, Univ. of York.